I purchased this item and I receive a small commission if you shop using the links in this post. Maybelline Dream Velvet Soft-Matte Hydrating Foundation ($10.99) is a new hydrating matte foundation. Wait, what? Hydrating and matte? Is that even possible? That’s exactly what Maybelline Dream Velvet Soft-Matte Hydrating Foundation is though! This is a new hydrating matte finish foundation that promises to keep skin moist yet still manages to provide a smooth, matte finish. Dry skin is a pain to deal with but oily skin can can be both rewarding and equally as troublesome as dry skin sometimes. Controlling oil and shine and curbing dryness and keeping skin moist is incredibly difficult sometimes. When skin is dry we tend to want to add as much moisture as possible but we risk creating unnecessary shine. With oily skin our first instinct is to to control shine and we’re reaching for powders to mattify but there is such a thing as over mattifying which in turns leads to dullness, tightness, and even flakiness that’s because you may be curing shine but you’re also not providing enough moisture to skin. The question is how does one get the perfect balance? That’s where Maybelline Dream Velvet Soft-Matte Hydrating Foundation comes into play. Soft, matte, and hydrating enough for drier types without sucking moisture from skin yet gentle, matte, and lightly hydrating for oily skin to curb shine yet still provide a bit of moisture that won’t make you more oily or greasy. So yes, hydrating matte is totally a thing and Maybelline harnessed the power of it and put it into a foundation that both dry and oily skin users can enjoy. Maybelline Dream Velvet Soft-Matte Hydrating Foundation is possibly my new favorite foundation of the moment and I have a funny feeling you’ll feel the same way. Available in a range of 12 shades this soft, velvety cream foundation glides on skin like a second skin and looks incredibly fresh and flawless sans the dull, flat finish we associate with most matte foundations. There’s so many things to rave here I’m not sure where to start. This is a soft, velvety mousse texture with a creamy whipped consistency that blends flawlessly and smoothly into skin leaving behind even, soft perfected coverage. I tried it in the shade 75, Natural Beige and the color was near perfect because out of the tube it is a bit dark but once applied it lightens up considerably. This has a very cool feel on skin with a lightly moisturizing finish that does in fact provide a matte but never flat or dull finish on skin. I was worried it would adhere to drier, flakier areas on my face but it did not. What it did do was provide smooth, flawless coverage that was easy to build, easy to wear, and incredibly lightweight. It wore for me a solid seven hours without fading and without setting with powder. 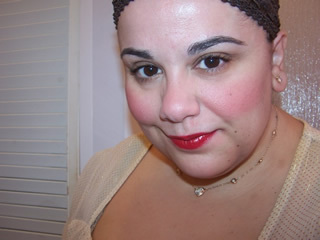 It just looked so beautifully natural on my skin and brightened up my entire complexion. If you have larger pores or finer lines this will blur their appearance very easily and provide you with a smooth, working canvas for other makeup. It has the second-skin coverage I love so much but it is so weightless and light that it never cakes up or looks made up nor does it catch on my drier areas! It’s just smooth and beautiful no matter how much I apply. It’s just pure, airbrushed joy! Maybelline also introduced a Dream Blender Foundation Blending Sponge with this which I have a review of scheduled for later tonight. This makes application really easy but honestly, this applies perfectly with fingers just as well as any brush or sponge. I’m trying not to over think the idea of a hydrating matte foundation because that has to be some sort oxymoron right? But none the less that’s exactly what Maybelline Dream Velvet Soft-Matte Hydrating Foundation provides! A matte yet lightly moisturizing foundation that can be enjoyed by both oily and drier skin types a like for a flawless, airbrushed finish. Great job Maybelline, great job! Available now at drugstores or drugstore.com. Thanks for your review Muse. I saw it on drugstore website and had it in my basket. I was interested but decided to wait. I have combination skin. I guess this would work. my pleasure! I hope it works for you! How would you say the coverage is? I’ve got alot to cover. sheer to medium, very customizable and doesn’t look caked on when building but when you say you have a lot to cover, a lot of what exactly? It’ll do well with some blemishes, redness, and minor darkness but if you have major acne or acne scarring, rosacea, it might not be enough coverage! What is your skin color in MAC terms muse? I found it in harmon but having trouble finding a color match. Glad to see a DS foundation score well! Harmons and drugstore.com also has in stock. That foundation sounds so good! I love the L’Oreal Infallible 24h Matte Foundation, but the lightest shade avaible here is too dark for me at the moment. I hope this comes to Germany, with the fair shades please! Well snap! Looks Loken I need a new foundation and a new brush. Thanks for the in depth review. This sounds like it will be perfect during the winter. Muse, thank you so much for your review! I was considering this foundation, but wondered how it would fair on my dry, mature skin. Definitely gonna try this one out, as it seems like it would suit just fine! haha you have a hysterical sense of humor, totally made me laugh! 🙂 Hehe! I think it’ll be fine! I’m like the Sahara right now and it looked smooth and blended beautifully! I hope you like it Dee! This is a must try. I love having some good drugstore foundations to use. I sounds wonderful. I can’t remember when I last bought a drugstore foundation, but I have to try this one. Thanks for the review. So excited to try!!! Is this a light coverage foundation? Man! I can’t wait to find thus in Canada! All the releases! Makes my heart ache and wallet cry! Lol can’t wait! Hi Isabella! I’m new to your blog and I really love it and you!!! I realy appreciate your drugstore reviews as I just don’t have room in my family budget for Prestige prices! (Plus, I don’t go out anymore, cause I’m an old fuddy-duddy who basically only wears makeup to work). I’m very curious about this because, to me, this just seems like L’ Oreal’s Visible Lift Blur Foundatin re packaged for the Maybelline younger crowd. (Especially when the first ingeediens I see are cones!!! ) What is your opinion? Do they have any similarities in your eyes other that the exact same packaging??? Thanks for your wonderful reviews!!! aw Anastasia! thank you and welcome! Happy to have you here 🙂 It’s not at all like Visible Lift Blur, the formulas are two very different formulas. Just the packaging, otherwise the formulas are quite different 🙂 This is a whipped, velvety texture and the L’Oreal Visible Lift is a thinner cream. 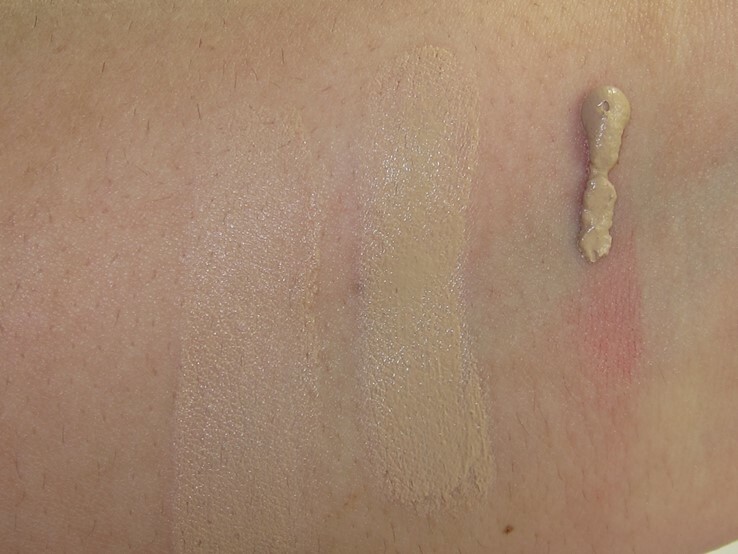 If you look at this post you can see how vastly different the swatches are https://www.musingsofamuse.com/2014/06/loreal-visible-lift-blur-foundation-review-swatches.html Hope this helps and thank you for your lovely comment! This is exciting. I don’t really wear foundation because I don’t have a good one (I use L’Oreal True Match on the few occasions when I decide to wear foundation) and while I don’t mind my natural skin, it might be nice sometimes with more dramatic eye makeup to have a more flawless finish. Thanks, Muse! BUT OMG. Maybelline. You have outdone yourself. I absolutely hate wearing foundation because by the end of the day — without fail — i become a disgusting melted mess. But this stuff…I love the moussey-gel texture that glides on and it seriously feels like nothing on your skin. Again, I repeat, I hate wearing almost all foundations because I can’t stand feeling the foundation “sitting” there. This foundation is lighter than pretty much all of my BB creams (it’s seriously weightless, guys), provides really good coverage (hyperpigmentation here), and it is a silky matte finish without being drying at all (like most “matte” products)! It really is hydrating! My only downside is — lasting power. It still lasts fairly well and I think for most people the lasting power would be good. On my skin one day, I noticed some settling on my larger pores. However, I am convinced if I could just find an amazing primer for my grease bucket skin, I’d be set. Despite this concern, I remember sleeping through the night with this foundation on and looking remarkably intact and smooth the next morning….with no breakouts…brb while I go buy all the tubes. ha awesome Jennifer! Skin tone twins 🙂 Thankfully they don’t break me out but I’m always terribly disappointed by them 🙁 I am so glad you liked this as I felt it was quite lovely as well! A good prime is key! 🙂 haha I’m so glad you love this! Enjoy reading your review of it! Hi Isabella, do you use MUFE HD foundation. If so what color do you use? I don’t know what color I would be in the Maybelline Dream Velvet Soft-Matte Hydrating Foundation . I am MUFE 118. Does someone know what color? I don’t sorry! But hopefully someone else can help! Thank you kindly. Did you find that the 75 was the right color for you? hi yup, like I said in the post it was a near perfect match for me! Hope this helps! Good luck! I’m not sure. mac shades don’t work for me, they are either too beige or too orange. I’m guessing around nc30 but that shade is a bit too beige for me. I want to try this! Any suggestion on which color? I’m pale with cool undertones. Also, would this be too have for spring and summer. Thanks! Too heavy is what I was trying to say. Hi! Does this shade compliments not so tan skin? You know, not the american skin tone(white). I’m a Filipino. I fell in love with this foundation when I first used it. It really is perfect for all skin types! How are you Nadya? Awesome 🙂 Let me know how it goes! I managed to try this! Mine is in shade 15 Ivory. Tried with L’occitane’s Reine Blanche moisturiser n primed with The Body Shop’s Blur Effect Primer.. Had dry patches and it was streaky even with a sponge.. It was quite a while til I had it blended out well..
Primed with Laneige’s Moisture Primer, applied and blended with fingers half side of my face, and used Sigma F88 angled kabuki.. Blended better with the brush. And less dry patches. Foundation was dark when squeezed out,but blended out in a lighter shade. Thanks for sharing Nadya 🙂 very helpful! Happy Holidays!